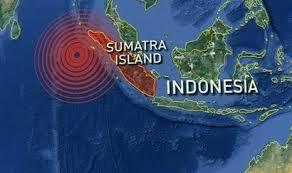 JAKARTA, Indonesia — A strong earthquake struck Sunday off the coast of southern Sumatra in Indonesia, causing panicked residents to run from their homes but no major damage. National Disaster Mitigation Agency spokesman Sutopo Purwo Nugroho said the quake was felt for about 10 seconds in coastal cities and was strong enough to shake belongings from shelves and topple furniture. Residents ran from their homes and there were power outages in some areas but no reports of casualties or structural damage to buildings, Nugroho said.